Denmark's national copy of the International Prototype Kilogram, delivered to Denmark in 1949 with an official mass of 1 kg + 81 µg. ↑ The metric system was introduced in 1795 with six prefixes. The other dates relate to recognition by a resolution of the CGPM. ↑ Despite the prefix, the kilogram is the base unit of mass. The kilogram, not the gram, is used in the definitions of derived units. 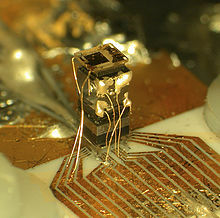 ↑ "NIST Unveils Chip-Scale Atomic Clock". 2004-08-27. http://www.nist.gov/public_affairs/releases/miniclock.cfm। আহৰণ কৰা হৈছে: 2011-06-09. ↑ Barry N. Taylor & Ambler Thompson Ed. (2008). The International System of Units (SI). প্ৰকাশক Gaithersburg, MD: National Institute of Standards and Technology. পৃষ্ঠা. 23. http://physics.nist.gov/Pubs/SP330/sp330.pdf। আহৰণ কৰা হৈছে: 18 June 2008.